Dublin Contemporary 2011 was a big ask. We are, in this country, often adrift of the curve, somewhere between a second thought and a small wish. In this respect, the whole conception from beginning to end was a true achievement in its ambition and also in its disregard for the rules of play. Let us not consider the politics surrounding the event as anything more than reality, no doubt one from which a lot will be learnt, and taken by those who must. What is more is that thing called art, or at the very least, experience, and this is where the most value can be drawn. Broad, spectacular, light and deliberately opposing, it is perhaps then a funny thing to say that the expression of the works as a whole was portentously political. The building itself, a cadaverretrieved from back in the days when it facilitated science lectures, reflects well the type of ideology which has reanimated its shell, a kind of digging which is bound to lead to something of note being found that will support life. But still no art has been discussed, so why not begin with the work of Niamh O’Malley? Her cinematic quietude presented us with the bricks and mortar of decay. A moving piece, the simplicity of Quarry is its grace, each scene slowly revealed as an uncomplicated process of soft focus, gently introducing us to more weighty forms. 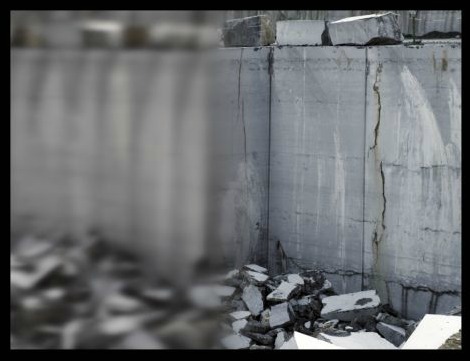 In its visual form, the material truth of stone is represented as something found closer to our own experiences than the cold, hard silence that it may initially evoke. The simplified conditions of darkness and silence are in superb contrast to the black fabric screen which acts to hold in place the subtly of the video work, while still allowing for the obvious monumentality of each new revelation. Prior to this revealing, the visual suggests a type of pile-up which is synonymous with horrific images of corpses lying at the bottom of a trench. It is only through the second take of each scene that we are allowed to put that sort of worrying interpretation down and replace it with a considerably more solid understanding. If life too is so rewarding, then the degree of maturity exhibited by O’Malley is an enlightening prospect. The opportunity to wrangle together those names adjudged to be ‘big’ in terms of international art was, by and large, resisted. Be it expense or choice or a mixture of each, there was still room for Jannis Kounellis, whose work was placed next to that of David Adamo at the far end of what appeared to resemble a school gym. The work of the latter, consisting of wooden sleepers stood upright, their sides visibly chipped away, reveal forms that verge somewhere close to an edge, as implied merely by the fact of their standing. In the work by Kounellis, a wire mesh has been adorned with large pieces of wood, each one strikingly gold and special: the flotsam and jetsam as salvaged from the wreckage of a dreamer’s voyage. Coats hanging in front of these gold flashes bring to mind a taste similar to that of Joseph Beuys, and in-so-doing theatre is illuminated by a relatable character. No doubt the incantation of Beuys is my own but the room is no less provided, even if it is at first dwarfed by the status that has been appointed to the issue of value and power. However, in many ways it just looks like big art in small hands. The biggest work on show was arguably Cradle by Wang Du. 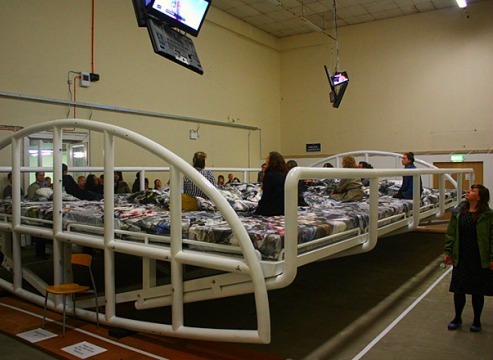 Created in 2007, the interactivity of its rock-a-bye feeling, complete with video mobiles hanging high in clusters of TV screens, extends the invite for all to join the mass bed-in. As an offering, it displays the many semi-objective viewing points from which to witness perpetual news feeds. At its core, the experience is a tactile and belittling one. It appears to illustrate with play, the mechanisms of war in contemporary times, aided on all sides by the expression of a voice for a people. Du tells us in no uncertain terms that the comfort is real but the truth is clearly worsening. Clearly due attention must be paid to the news of most general significance and also as apparent, the latter is growing according to its mass market. Of course there is nothing wrong with this added exposure as long as there is an awareness to the responsibility as a result. You cannot un-know and thanks to this work, the argument against knowing is weakening always; the trouble may be that we don’t particularly care, just as long as we’re comfortable. And it’s big and, if possible, larger than life. 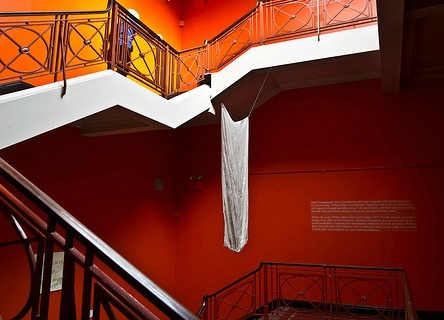 The staircase which wraps the walls leading you up and down the building shows two works that might almost go unnoticed amongst the buzz of art and ‘free class’ enthusiasm. 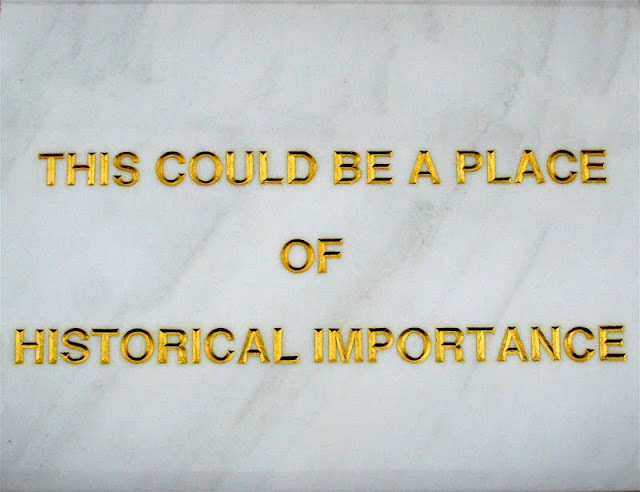 A piece by Braco Dimitrijevic is titled and reads “This Could be a Place of Historical Significance” and in its placing there is a sense of humour and joy at the pointlessness of its statement. Gold painted lettering inscribed into white carrara marble; it is completely placeless, subscribing only to the realms of an English speaking world, it might well be universal in its application and expression. If it says nothing, it matters not what it says. A work by Irish artist Ella Burke hangs between floors and although it cannot be touched, it’s title White Flag suggests that it may be blown. However the added weight from the thick layer of white paint covering the flag means that no little effort is required to get the winds up, but perhaps she is saying just that it is possible. Visually this work represents dirty washing more so than any identifiable nation but in this case the fact that it speaks of no place means only that where it is, in turn implies an identity that overrides all other readings. A shabby kind of glow emanating through a solitary voice, the flag has been turned on its side so that now it shows a blank portrait where once a tricolour shone brightly. 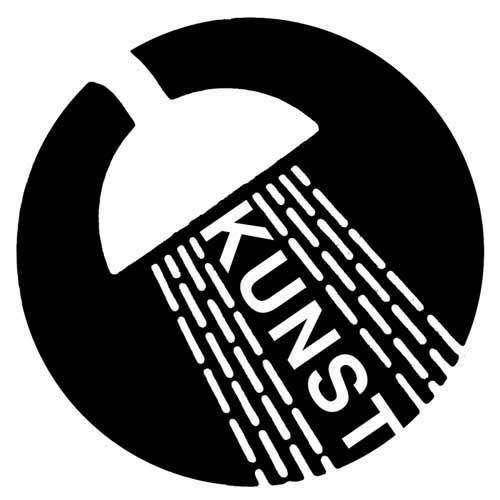 There is no need to buy into the recession to be a part of the dialogue and art is no different to any other industry in this respect, somehow managing to develop the groundwork for a creative sector that can promote and profit thanks to the popularisation of culture as a commodity. William Powhida, a New York based artist is aware of this discrepancy in the numbers. His showing consisted of skilled and intriguing watercolour re-workings of pages from, or possibly imaginings of, his life in the lens of celebrity. Whatever his life, his work displays a broad awareness: in one piece he outlines a draft statement entitled A Philosophy of the Super Wealthy, or the 1%, and although the space it occupies is modest, the message to the 99% is glaringly obvious. Amongst the mock philosophies, he puts it to us that “No Income? No Employment?” means that you are in the eyes of the 1% a “high-yield, high-risk investment vehicle.” It is tempting to claim some form of bankruptcy or to just turn the board over and start again, but the game is stacked it seems and be it the iron or the old boot, new dice must be sought. And so as though to further underline our plight, the biggest joke was told by Assaf Gruber, an Israeli artist apparently born in Jerusalem. 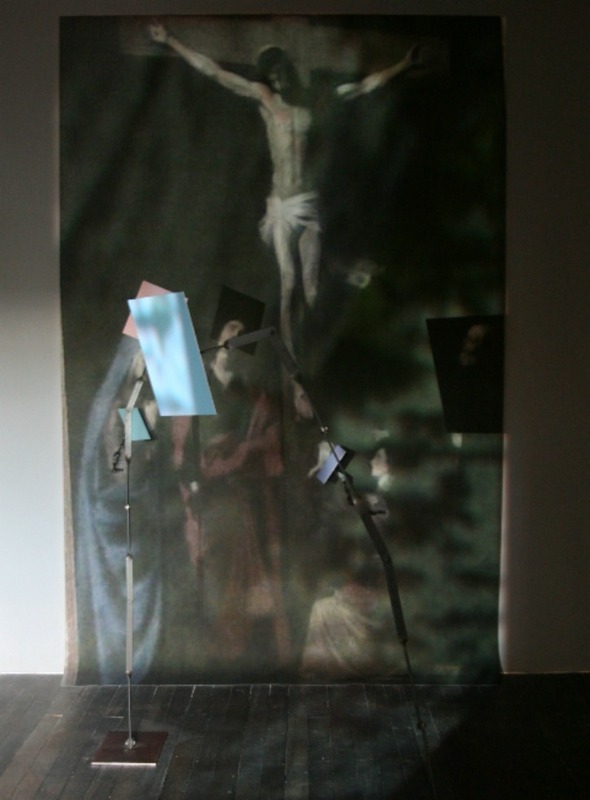 Using simply a projection of a climbing man played on loop over a frieze-like image of the crucifixion of Jesus, small tiny mirrors disrupt parts of the image as they stand erect on top of metal supports which in turn stand in the middle of the floor. Like on-lookers who have been facing the wrong way the whole time, they might well be reflecting the misplaced trust that we hold in gods and machines when greeting the truly spiritual experience of life. There is, it appears, a desire to feast on death and danger in order to progress, but replacing that with the bigger picture shows us that art is neither, and that no matter what the source, belief is founded on an essentially human scale. In terms of the work itself, considering that it manages to illustrate our loss with such eloquence, it is probably only right to overlook its horrible presentation, crammed into a space not big enough for a dog to feel free. 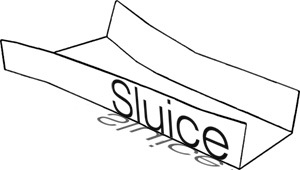 Another work by the same artist explores the tensions of sculpture in a way which not only suggests that the flawed installation of A Great Big Joke was a curatorial error but also that the artist’s own understanding of life is in itself a sculptural model. At the very least, in this light, life can be as hilarious as any scriptwriters attempt to can humour. Presented in a ridiculously small room at the end of a long hallway, short clips taken from mainstream movies are re-identified as each being “A Study in Sculpture”. Everything from sci-fi to romantic comedies of the 80’s have here been refocused as measurements with which to locate the formal attributes of a sculptural approach and insight. Given that the spaces in Earlsfort Terrace have gone through as little face-lift as possible in preparation for their latest use, it might be nice to mention two works which incorporate space as a fluid rather than a solid, subject rather than object. In another curiously tight space, a video work by Matt Calderwood shows us how he once made six sculptures using the same 6 parts each time round. This may sound less than it looks and all that can be said is how with the inclusion of basic geometry and clever artistic choices relating to setting and form, nearly every work comes alive as a distinct and complete whole. There is an absence of both conceit and failure, and as we watch him make moves toeffect the shape before us, there is a tendency toward spellbinding mystique, as though something in the shape of the forms in fact made it impossible to be wrong. All in all, it amounts to an enjoyable jigsaw, wherein each piece is replaceable with its copy and although you know nothing would change, the form is still somehow kept in motion. When I was there, Dublin Contemporary was a busy place and the constant stream did indeed help to soften the senses to the hardwearing motifs, punched out heavy-handed by artists who often gave less than they took. Although less poetic than Calderwoods’ plasterboard forms, Horror Vacuii by Alejandro Almanza Pereda did reach a high enough point of expression that he can be seen as justified in destroying the painting which supports his work. Consisting of just this painting, a wooden frame and concrete, and with only the bottom third of the painting visible, we are invited to concede that our relationship with value is one that is not in itself as valuable as the fact that we firstly perceive value to be a living thing. We are never informed as to what the whole painting looks like or indeed if it is a particularly well known work, all we know is that the concrete mound which fixes it to the wall is now part of, and essential to, the perception that we hold. All that is left is for us to decide the balance of give and take and perhaps even whether or not art is so easily pinned down. In this instance, it is clear that a construction no longer present was required if ever the art and the gallery were to be seen as one. Such is the size and temporality of the whole exhibition that a mark made on the building by Maser might well be the longest lasting contribution. It falls then to where it leaves us now, which is: that without a show of this type, is Ireland losing out? Our only response can be to make use of the time that it has afforded to art in Ireland and hope that its failings will not give an impression separate from that of the people who were asked to pay to see the world around them. October in Ireland saw a great expanse widened further and has served to demonstrate the measure of politics to be indistinguishable from the expression of the people. The fact alone that practically every space in Dublin made efforts to take part in the project represents good value for money in anyone’s eyes. Also it highlights the willingness of private galleries to absorb the benefits of our nation’s Minister for Art and Tourism being until quite recently one and the same individual. It was anticipated that Dublin Contemporary would mimic the success of the Venice Biennale. Having never been, I can’t say, but it can hardly amount to the same thing. Of course we are entitled to believe in the possibility of action and engage in arenas which are maybe less traditionally ventured but a sense of realism is all you need if not to feel disappointed when it turns out that the party wasn’t quite what you had hoped for. Ireland approaching its centenary as an independent state has perhaps never been so directly bonded to the workings of international influence. With now the EU, IMF and broadly speaking, the global markets, seemingly putting added demands on government, we are in the line of fire for all sorts of reasons external to the realities which here and now face us. The social imperative of this is that we weigh up pros and cons of our diminished sovereignty, in particular with respect to understanding how we are seen and how we see ourselves. This said, Belgian artist Maarten Vanden Eynde has come eerily close to the true identity of our psychological crisis as a nation. His work The Earth seen from the Moon incidentally made in 2005, occupying one of the many small rooms upstairs, manages to illustrate the deficit of ‘us and them’ simply by pointing a telescope at a blue helmet. Once seemingly worn by U.N. peacekeepers, its marks indicate how vital a piece of equipment it actually is in places where peace is constantly under challenge. Given Ireland’s pseudo-neutrality, our armed forces have traditionally been put to use in places just like this. Having for a long period been close to the threat of violence, our involvement in UN missions is surely reflective of our unwillingness to return to anything like the volatility and social upheaval of past events in our nation’s history. When you look down the lens of this telescope, you spy the United Nations emblem of our planet as seen from above, wrapped as it is by olive branches. The telescope is white. As a view from the moon, our world appears barely significant, and a closer view only reveals greater damage on the helmet’s surface. Consequence is, according to the exhibition catalogue, “a science of first things”. It is perhaps also a fear of consequence that drives the more economically vulnerable nations like ourselves deeper into the illusion. The illusion being that if we as a society are well behaved, then we will be taken care of, and that ultimately peace will remain. Even with economic contagion, a real consequence of interconnected markets, surely the measure of our acts will be felt first of all by ourselves. This is of course once we don’t make the mistake of confusing permission with capability. It would seem that the further the challenge is put upon the world’s impoverished, the closer it comes to be resolvable only as a condition of war. This is not exclusively true of Ireland but as we can see from the United Nations’ flag, we are all standing under the one umbrella, and pushing and shoving will no doubt lead more and more to fall. If it might be taken that Dublin Contemporary is a timely opportunity to sense a global voice from within the many expressions made, then observing the rise in political awareness as a response to low levels of trust in state politics on an almost global scale is maybe a gift that will keep giving. We are not so much told any longer that these are uncertain times, instead it is taken as a given. The problem with this is that weakened politics at home are undermined further by influences which really have no bearing on our future other than fear and the resulting threat of war, instability, famine or worse, political excommunication. The fear is what gets you. Fear of the moon may once have kept us at a distance, she was a goddess, a harbinger of dreams, a fiction. Having been, it is now widely accepted that it’s a rock. No less magnificent or beautiful but it is no longer an object of art. This means only that we must express responsibility as equal to any conceived advantage. So too is it true on a smaller scale, whereby our intentions may only ever be confused if it persists that Ireland sees itself as openly and overly subject to the host of external forces and self-interested bodies. The moon still spins, a full rotation roughly every 27 earth days. However it took outside observation to identify why for most of us it seems to always be the same side that we see. From within the main building at Earlsfort Terrace, art is alive and well. Talk of whether there will be another Contemporary inevitably falls short of any type of real commitment and it will as such remain to be seen. Of course one of the great things about art is its ability to show us something in a new way. Berlin based artist Alicia Frankovich showed a video work downstairs entitled Volution, in which young multi-ethnic individuals encircle one another. Were a still to be taken, it might imply aggression and oppression but as these individuals move continuously around their definably urban space, dance is all which comes to mind. In the end, no one is hurt.